By Giacomo D’Alisa, Federico Demaria and Giorgos Kallis. 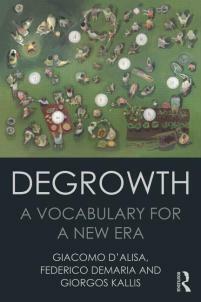 This overview of degrowth offers a comprehensive coverage of the main topics and major challenges of degrowth in a succinct, simple and accessible manner. In addition, it offers a set of keywords useful for intervening in current political debates and for bringing about concrete degrowth-inspired proposals at different levels – local, national and global. Simply visit www.routledge.com and enter the code FLR40 at checkout. Silvia Federici, Hofstra University, Hempstead. David Graeber, London School of Economics, London. Manuel Castells, University of California, Berkeley. Karen Bakker, Universty of British Columbia, Vancouver.